It happened around the time that little girls decked out in green uniforms and sashes were knocking door to door. The big cookie craving began. Starting with my husband, the first request came. Well, actually, it was technically a statement. “You haven’t made oatmeal cookies in a while,” he mentioned. I understood what his observation really meant. My daughter was a little more direct. Between their requests and images of Samoas and Thin Mints inundating my Facebook feed, my inner cookie monster began demanding: ME WANT COOKIE. 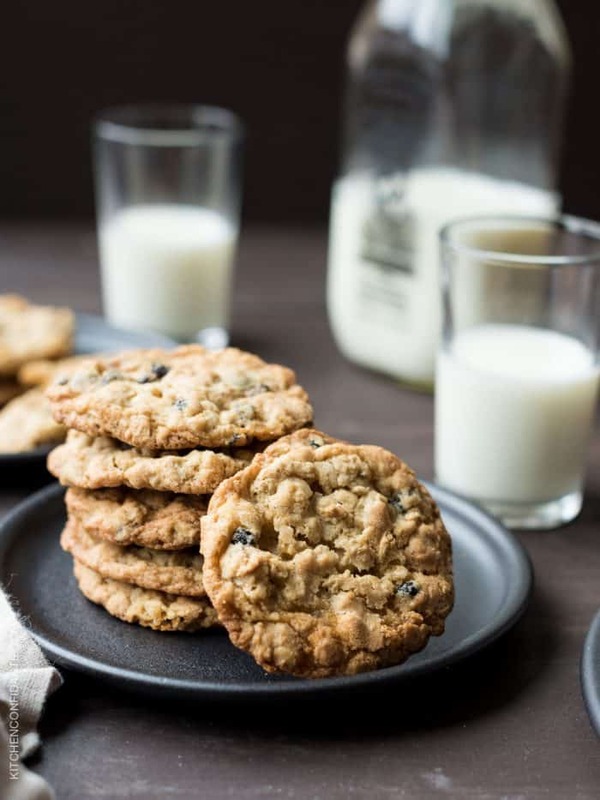 These White Chocolate Chip and Currant Oatmeal Cookies were several iterations my daughter and I made over the course of that week, and these were the ones that we devoured the quickest. Chewy and soft, the edges just crisp, the white chocolate chips gooey with each bite, the little currants tiny punctuation marks studded throughout – they were our favorite of the bunch. With our mini cookie labs, the Girl Scout cookie craze actually came and went, and for the first time that I can remember, we don’t have a single Thin Mint in the house. But, as you can see, it worked out just fine. There’s always next year. Better make a double batch. 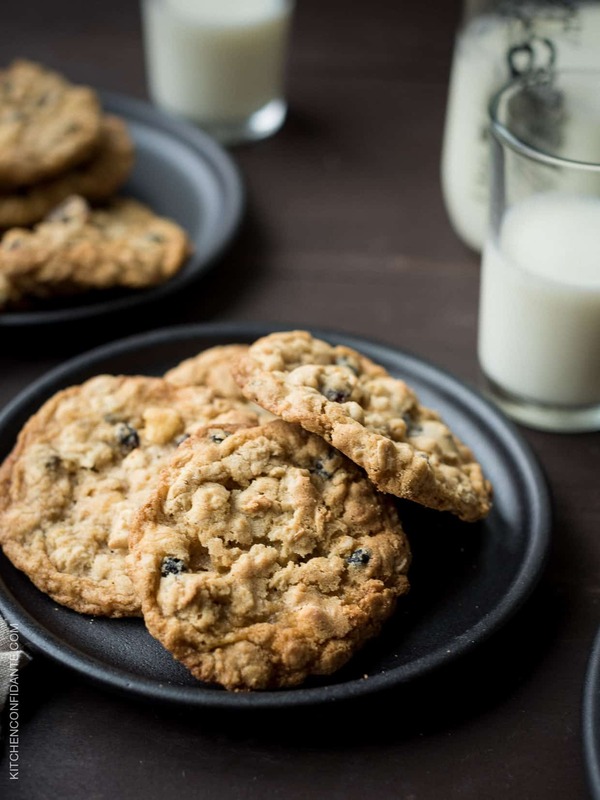 These chewy White Chocolate Chip and Currant Oatmeal Cookies will disappear before your eyes. In a large bowl or in the bowl of an electric mixer, beat the butter for about 2 minutes or until light and fluffy. Add the sugars, beating until combined, then add the eggs and vanilla. Mix until combined. Add the flour mixture to the egg mixture, stirring until just combined. Stir in the oats, currants and white chocolate chips, taking care not to over stir. Use a small ice cream scoop or medium cookie scoop (about 1 1/2 tablespoon size) to scoop dough and drop onto the baking sheet at least three finger widths apart. Bake for 10 minutes, or until the edges are crispy and the cookie is golden. Remove from the oven and let it cool on the baking sheet – it will firm up as it cools. Transfer to a cooling rack to cool completely. Enjoy warm or store after cooling completely in an air tight container at room temperature. Adapted from Oatmeal Raisin Cookies via Food.com. MMMMMmmmm! Yes, please! My inner cookie monster is very excited right now! I love oatmeal cookies and the mix of currants and white chocolate sounds amazing. I am definitely going to be making these soon!